How I wish you could all have been at the opening of the Timescapes exhibition, featuring Taan’s Moons felt artworks and drawings created by 70 young and talented Haida Gwaii students as well as five other projects created by students in BC, at the ArtStarts Gallery in Vancouver! The ArtStarts staff, notably Juliana Bedoya and François Grenier, did such an amazing job to artistically display the pieces. With a team of volunteers they worked many long hours to make sure the artworks were hung with care. The display conveys the phases of the moon and suggests a cozy bear den. Nika chose this song, which was received from the Nuu Chah Nulth in exchange of a Haida song, “as metaphor of cultures working together in art and knowledge to achieve something great. Additionally, bird songs left with the bird migrations and returned when the birds do – a Haida understanding and view of time and ties to our natural world.” Haaw’a to both Joanne and Nika for your gifts. There was a great turn-out; locals, children, friends and even family members of some of the young (and older) artists showed up and were blown away by the work these young children made. Grandparents of Anezka (one of the young artists) in center, my sister to their right and Tonya Martin, publisher of Taan's Moons book, to their left. Congratulations to all these young Haida Gwaii artists on your first exhibit at a downtown Vancouver gallery! The Timescapes exhibition will be up till the end of August. 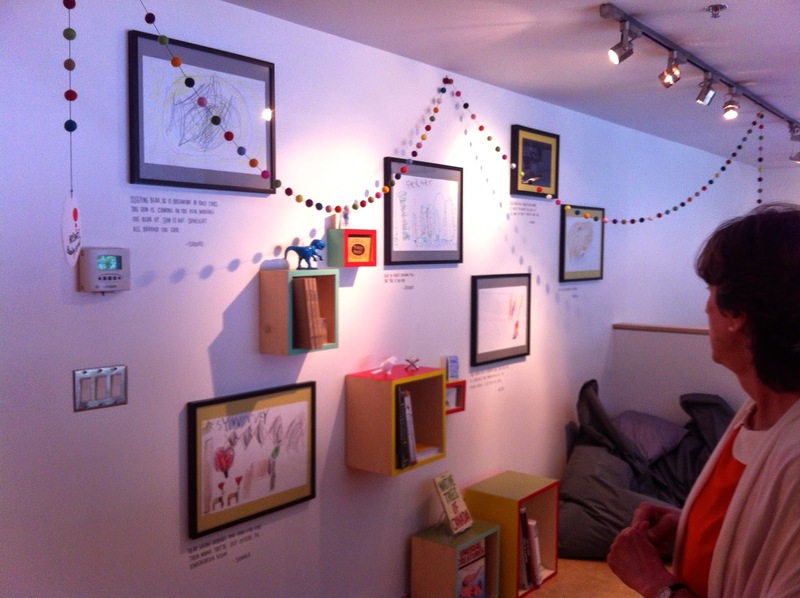 I encourage everyone to visit the ArtStarts Gallery, at 808 Richards Street, when you’re in Vancouver next. It’s a wonderful gallery for young people and I’m sure you’ll come away feeling inspired! The Taan’s Moons artpieces will return to Haida Gwaii in the fall. We are planning an exhibition to coincide with the Taan’s Moons book launch before Christmas. I would like to thank everyone who made the Taan’s Moons project such a huge success, from teachers, students, volunteers, ArtStarts in Schools, Literacy Haida Gwaii, Gwaii Trust Society, SD50 to the support team behind Taan’s Moons and of course to Joanne Yovanovich for sharing the knowledge, and to Alison Gear who created such a beautiful poem that inspired so many of us! To me this whole process is like watching a drop of rainwater fall in the ocean, merging yet creating a ripple effect, now reaching new shores, inspiring countless others. Haaw’a for your generosity. And haaw'a, thank you to Siobhan Rich, for the use of her photographs.